As everyone knows, spices are the true kings of the culinary world. They add that zest, flavour and distinctive trademark to many of our favourite dishes. But there is many a kitchen cupboard that is stuffed with tiny bags of mismatched jars of cumin, Sichuan pepper, chilli & powdered ginger. It may look a little exciting and spontaneous, but it's not great for the long-term storage of these all important aristocrats of the kitchen cabinet. The problem is that we tend to gather more spices than we anticipate and it's common to outgrow your average spice rack. At the same time, we tend to use some only infrequently and hold on to them for a long time. This can lead to common issues with moisture—particularly if you live in a humid climate. We will explore a few airtight solutions here. But before we get started, it's important to note that you should never, ever use a damp or wet spoon to scoop out your spices. Kitchens are also damp places when we're in the midst of culinary creation so it's also important to close your containers tightly as soon as you are finished using them. So let's start exploring some options for storing herbs and spices. Enjoy! Before we explore solutions for dried herbs, we thought you might like to see this fabulous herb garden. It's the freshest storage solution of all! No matter how little natural light your kitchen receives, it's still possible to have a thriving spice garden like this right in your kitchen. 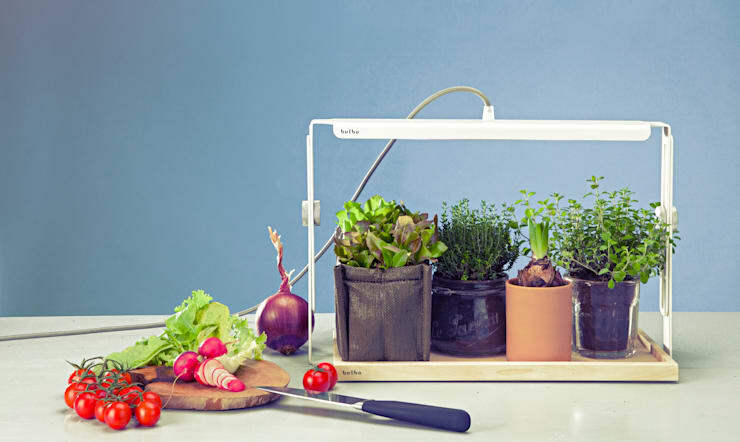 Bulbo lighting has created these dedicated LED lights for growing herbs, flowers, spices and even vegetables in the home. They have won lots of awards for their designs and aim to promote the concept of urban farming for all. There's no healthier way to keep your herbs and spices close to hand! Magnetic spice jars are a lovely, sophisticated way to display a huge amount of spices on your wall. It could be a very simple project for DIY enthusiasts. All you need to do is glue a sheet of stainless steel to the wall. Attach magnets to the base of some attractive jars like this and simply arrange them on the wall. It will look so colourful that it might be easy to go a little overboard and fill an entire wall. It might be a good idea to arrange your favourite spices within easy access. A masala dabba or Indian spice box is an important part of any Indian kitchen. Traditionally it was made from small, round stainless steel jars, but Tupperware has created a plastic variant as seen here. These can be easily stored in a kitchen drawer and easily cleaned. As with all of the solutions mentioned here, it's important to do an annual checkup for the freshness of little used spices. 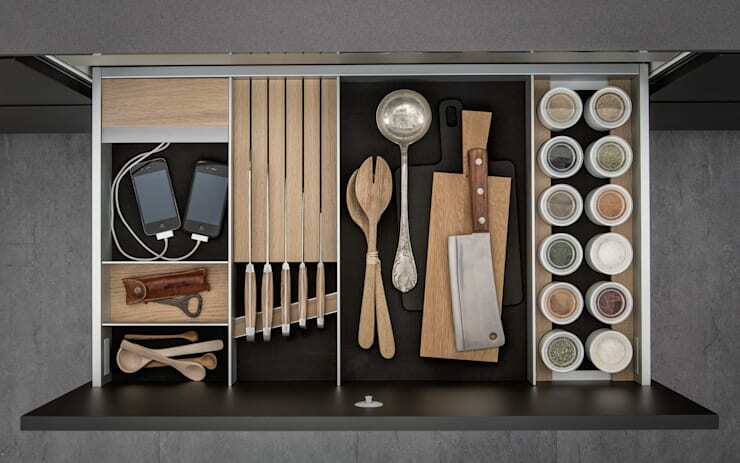 A huge variety of inner compartments can be easily installed within your drawers. This is a great, space saving idea. 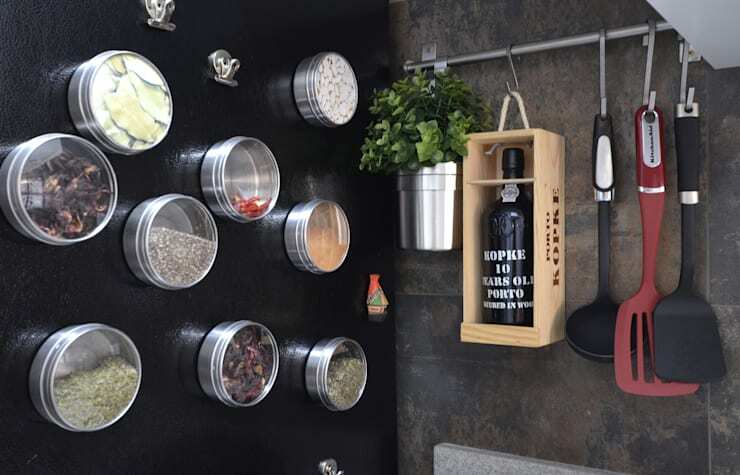 But if you are the kind of spontaneous chef that loves to have everything close to hand, this may be a way to store your less frequently-used spices. If you have the option, choose something like this that allows you to see the labels easily and avoid digging around. Spot the blue mason jar on the lower shelf here. Mason jars are watertight and have a lovely, retro feel to them. They are also cheap, easy and widely available, so you can always add to the collection without creating a cluttered feel. They are also so beautiful that they really should be put on display. 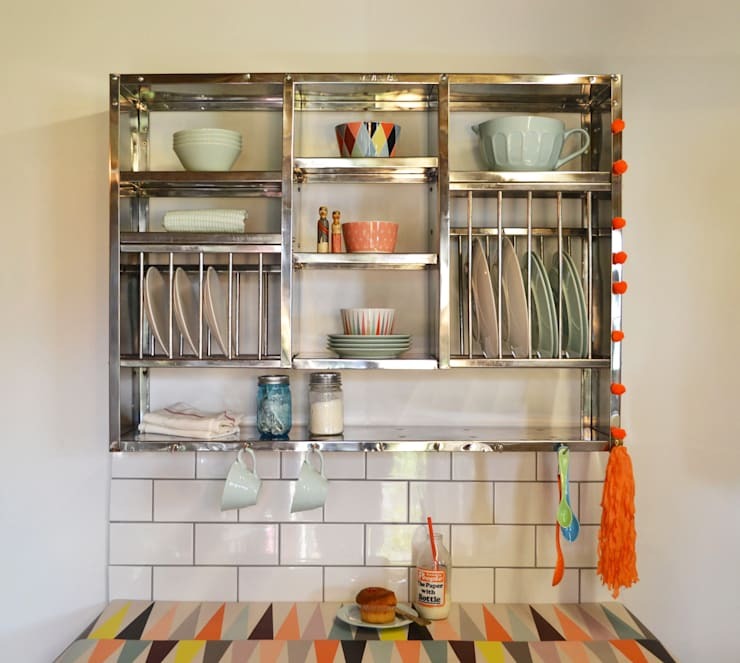 A great retro silver kitchen rack like this one by The Plate Rack is a great way to do just that! Cabinet doors are often underutilised in terms of storage because we tend to concentrate on the storage needs of larger items. A spice rack on the back of the door will be easy to access and is often situated at eye level. This means no more digging around in deep cabinets for that tiny jar of your favourite spice. At the same time, the shelf space only needs to be very shallow. To really make the most of this solution, add some dedicated lighting strips inside the cabinets. 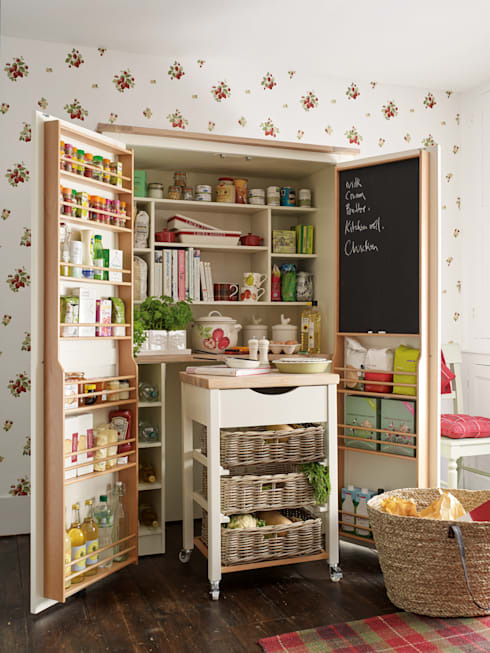 If you are interested in kitchen storage solutions, you would love this Ideabook Making the most of your compact kitchen. 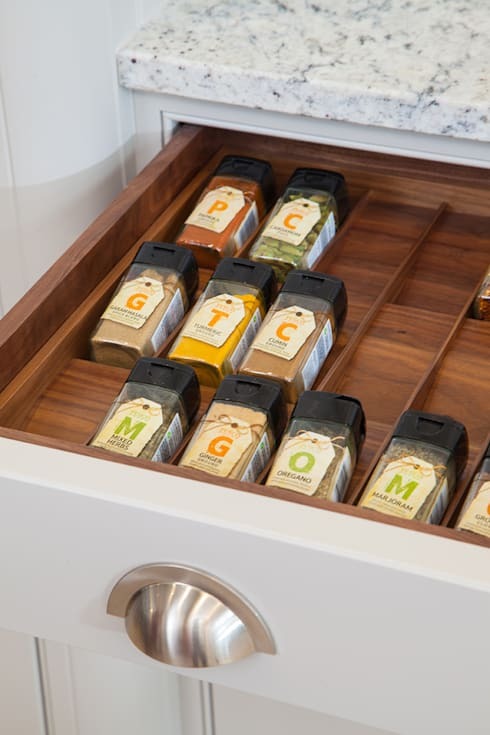 Which of these spice storage ideas are your favourite? We'd love to hear in the comments field below.